This easy-to-make, yet delicious, Tomato and Mushroom Barley Soup is chockfull of flavour and fresh vegetables. 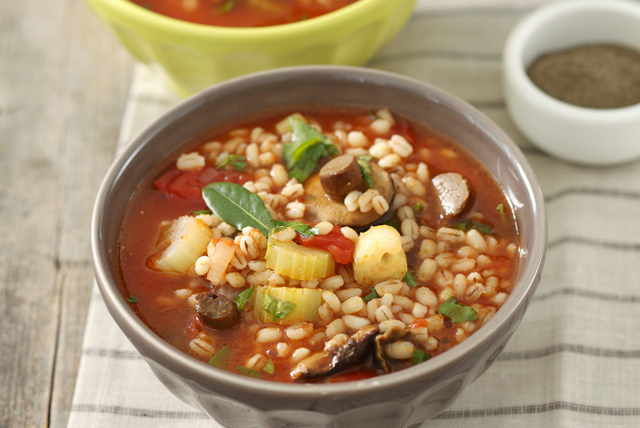 Mushrooms, onions, carrots and celery team up with the barley and canned tomatoes for a hearty and filling soup. Heat dressing in large saucepan on medium-high heat. Stir in water, tomatoes and barley. Bring to boil; cover. Simmer on medium-low heat 30 min. or until barley is tender. Garnish individual bowls of soup with fresh basil leaves just before serving. Serve topped with a light sprinkling of Kraft 100% Parmesan Grated Cheese.